Federico Maria Sardelli is perhaps one of the word’s most notable experts of Vivaldi music as well as a versatile and gifted artist (he’s a painter, a novelist, a conductor, a composer and a musicologist). He wrote many books about Vivaldi including a prize-winning novel. Twice nominated for the Grammy Awards (in 1996 and 1999), since 2007 he has been in charge of the Vivaldi catalogue (The Ryom Vivaldi Werkverzeichnis). He is the founder and the director of the baroque ensemble "Modo Antiquo". 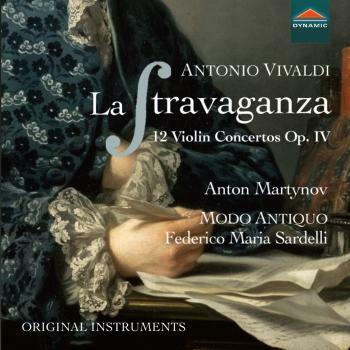 The Russian violinist Anton Martynov completes this remarkable cast for an outstanding Vivaldi. The ensemble Modo Antiquo performs here with aplomb alongside Martynov and Sardelli. Modo Antiquo is a protagonist of the current Vivaldi renaissance, having premiered on stage and in recording operas such as Arsilda, Tito Manlio, and others. Committed to the divulgation of Vivaldi’s rarest and unpublished operas, Modo Antiquo regularly records the latest rediscoveries as world premiere recordings. Born in 1969 in Moscow, Anton Martynov was first attracted by the piano and then the violin. He first learned about the Russian tradition at the Gnessine Academy, before leaving to study with Dora Schwarzberg in Brescia and Gigino Maestri in Milan. It is an astonishing journey that he follows which allows us to hear the musician as a soloist very early on, then to find him again as a member of the Anton Quartet from 1995 onwards, then collaborating with Philippe Herreweghe and Marc Minkowski. Violinist? Certainly, but we also discovered Anton… on the viola, piano, harpsichord, organ, as well as a composer and conductor! An intriguing musician? More precisely, fascinating. This is why Martha Argerich invited him to the Lugano Festival in 2012 and since then they have been performing regularly together in Italy, Spain and Switzerland. Their Shostakovich Trio, given at the opening of the Bologna Festival, was a real success. Another outstanding figure in Anton’s life is the violinist Ivry Gitlis, his friend and collaborator, to whom he dedicated a biographical opening performed at the Salle Gaveau for his 90th birthday. Anton approaches a singular repertoire that he enriches with his personal touch. He performs his own cadenzas (especially for Mozart and Brahms concertos), his own transcriptions (Barber, Bach, Schubert, Veracini, Rameau) and even his own concertos! His subtle and powerful playing is for him a way to invoke the spirits. With his baton and violin, Anton travels the world, performing at major festivals and prestigious venues. He collaborates with many orchestras such as the Orchestra de la Suisse italienne, the Brussels Chamber Orchestra, the Apollo Ensemble, the Maggio Musicale, the Modo Antiquo, the Sonatori de la Gioiosa Marca, the Novosibirsk Chamber Orchestra and the Symphony Orchestras of Istanbul, Izmir and Montenegro. Among the highlights of his latest engagements are his performance of Paganini’s 24 Caprices (Théâtre de Citadella, Italy), his recital with Nicholas Angelich (Auditorium of the Russian Cultural Centre, Paris), his recording of the complete Stravagenza by Vivaldi under the baton of Federico Maria Sardelli (to be published by Dynamic) and the release of Antonio Santana’s disc with a preface by Alain Duhault. This season, Anton will play with the Bolshoi Chamber Orchestra, give a recital with pianist Vassilis Varvaresos in Paris, tour with Martha Argerich and her group ReEncuentros in Spain and start recording the complete Schumann chamber music (Dynamic) with Elisa Tomellini and Luca Franzetti with whom he has formed a trio in 2017. Discography: Anton has recorded more than twenty records. Among them, his live recordings of the Lugano Festival are in the collections of the Martha Argerich Project (EMI, Warner Music). Three other CDs are dedicated to today’s composers Antonio Santana (Erol, 2014 and 2018) and Alexander Mansourian (Brilliant Classics, 2017). The first two records in the “Music for Two” series with Kremena Nikolova (NovAntiqua Records) made the front page of “Péché classique” magazine in 2016 and received the nomination for the International Classical Music Awards in 2017. The recording of Federico Maria Sardelli’s Violin Concerto under the direction of the composer (Brilliant Classics) was awarded 5 Diapason stars in 2014. Anton received the Order of Merit from the Caisse d’Epargne Ile-de-France (distinguished Grand Mécène de la Culture by the Ministry of Culture) for his talent as a soloist, composer and his musical commitment. Founder and artistic director of the festival Le Printemps du Violon, he is also at the initiative of the project “Russia in Paris”, as well as violin professor at the Royal Conservatory of Mons. In February 2018, he founded a new chamber orchestra, the Vivaldi Society, which made its debut at the Squadratori Hall of the Arsenal in Venice.